Cheesesteak, or Cheese Steak? Who cares really, because when it comes down to it the cheese steak (yes, I use that one) the sandwich is somewhat of a classic and just a killer sandwich. Now sure, we all know the classic is made from a top round of beef, or thinly sliced rib-eye beef, but lets face it, I love to switch things up from time to time. I began thinking of this sandwich when my sister-in-law had made a check in a few months back in Philadelphia. My brother-in-law, for the most part, and friend, has a son that was playing for the Philadelphia Eagles. Yes, I’m so connected, very far from knowing, to an Eagles player. He is actually now part of the training squad for the 49’ers, but still, she checked in, and my first thought was how lucky she was to have an experience at a well known cheese steak establishment. Now I have never been to Pat’s or Geno’s, and I will one day, but when it comes down to cheese steak sandwiches, I am all in. Instead of going towards the beef aspect, I wanted to turn my wife onto a chicken version instead. That’s what a good husband does right? Thinks about his wife, and turns her onto something just slightly more healthy and use chicken? Well, not sure how healthy this sandwich is, but trust me it’s great. Sure it replaces the beef with chicken, and it’s loaded with slightly tender onions and bell peppers, but it does have an awesome cheese sauce. That’s where it gets a little tricky. But, I did not mention that it served on some homemade, killer stecca, a recipe from Jim Lahey. This is a slow cooker style recipe, so it will take a bit of time to make the chicken, and you can prepare that ahead of time. Add the chicken pieces to your slow cooker, and toss in the garlic and water. Season with a bit of salt and pepper, to taste. Cook for about 6 hours, remove the skin and discard, then shred the chicken meat. Add the chicken back to the slow cooker until you are ready to prepare the sandwiches. While the chicken is cooking, get your pepper and onions cooking. I like to serve my mixture with a bit of a crunch, and not letting the onions and pepper get too soft. You feel it out, and go with what you like. Add the onions, peppers, salt, pepper, butter, and minced garlic to a nonstick skillet, and cook on medium heat until your desired texture. Set to the side when done. About 20 minutes before you want to serve the sandwiches, make the sauce. Melt the butter on medium heat in a sauce pan. Once the butter begins to bubble, but not brown, sprinkle in the flour. Then stir with a wooden spoon for about 4 minutes, stirring along the way. Once the flour is cooked through, slowly add in the milk and continue to stir to smooth out the ingredients. No clumps please. Once the sauce begins to thicken, slowly add pieces of the white cheddar cheese, and continue stirring. I know, stirring all the time, right? Please. Continue stirring in the cheese, slowly, and not overcrowding. I think you get a better cheese sauce if you slowly add, rather than being impatient and tossing all of the cheese in at once. Once all of the cheese is melted, and the sauce is smooth, get excited. It’s time to build. Get a sheet of aluminum foil, large enough to wrap your sandwich, and lay it down. Take your sliced bread and load it with the shredded chicken. 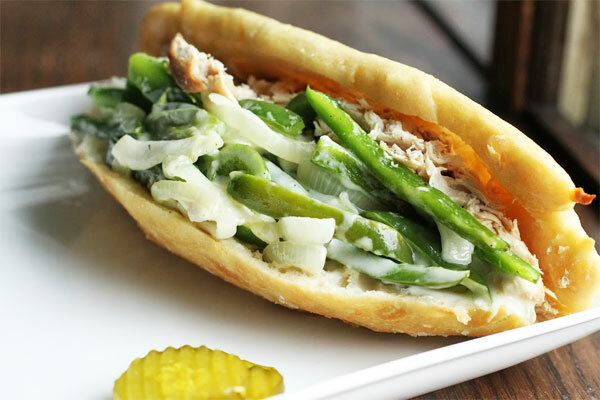 Take a big pile of the pepper and onion mixture and fold it into the sandwich. Ladle, or spoon in the cheese mixture. Clamp that down, then roll it up in the aluminum foil. Repeat with any remaining sandwiches. 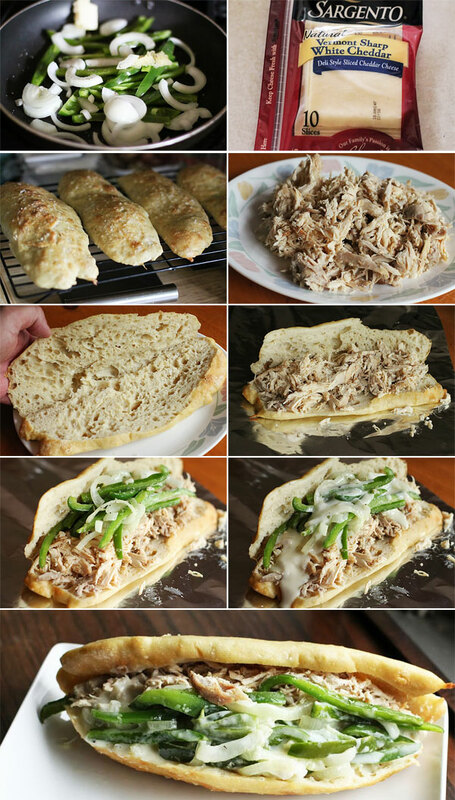 Place the foiled chicken cheese steak sandwiches in the oven for 15 minutes, then remove, unfold, and plate. Talk about a cheese steak! The chicken is ultra tender, and then you get some killer homemade bread along with a cheese sauce you made, with the texture of the crunchy pepper and onions! Need I say more? Forget Philly, you go this. I will try this out on my husband – a Trenton native and Eagles fanatic. You must try Pat’s when you’re in Philly, the steaks are to die for. I haven’t had the chance to try Geno’s. Apparently it is some sort of mortal sin in my husbands family to cross the road to Genos!